Toléderm Nutri-Soothing Rich Cream is especially suitable for dry, hiper-reactiv and intolerant skins, particularly in winter or after the summer when the skin is under-nourished. With preventive and restorative action, soothes the discomfort (stinging and redness) and moisturizes. Increases the resistance of the skin and protects it from external aggressions, decreasing its reactivity. Its action is due to the specific active principles association based on polyuronides​ of algae and Uriage thermal water. With a long-lasting effect, its non-oily texture and pack with dispenser allows an easy and hygienic use. Apply morning and evening, on the face and neck perfectly clean. Contains no fragrance, parabens, colourings or alcohol. Sensitive, hyper-reactive and intolerant skin, reacts very easily to small aggressions of the everyday life (climatic variations, air conditioning, perfume, etc.) causing a burning and tugging sensation. 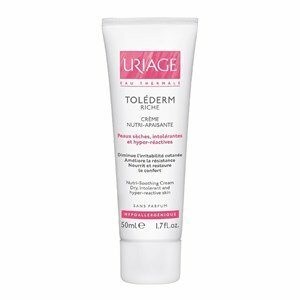 Uriage developed a line very rich in its thermal water with soothing and anti-irritating action for hyper-reactive and intolerant skin - Toléderm.